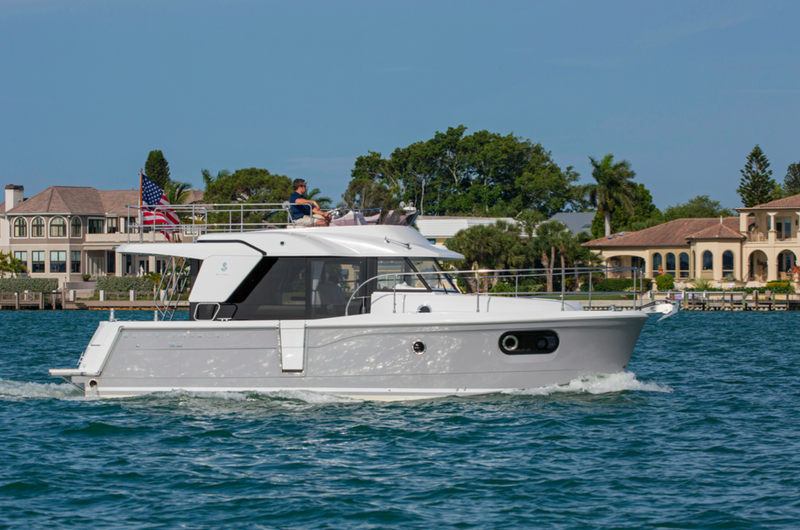 “Not your father’s trawler,” I thought, looking astern from a brand-new, first-in-the-USA, Beneteau Swift Trawler 30 throwing out a roiling wake as we headed north on Sarasota Bay at over 20 knots. Justin Joyner, sales manager for Beneteau powerboats in North America, and John Armstrong of Canadian Yachting welcomed me aboard. 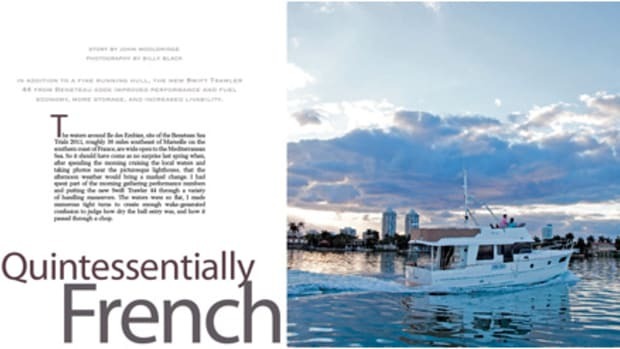 The contemporary design of the trawler looked right at home surrounded by gleaming new high-rise condos ashore and the sleek silhouettes of stylish multi-story motoryachts berthed along the dock. Perhaps the key to feeling larger than you are: Plenty of open-air space. 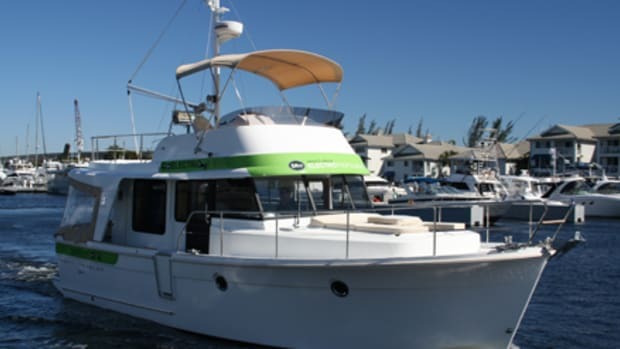 The Swift Trawler 30 was moored starboard-to, which you need to do to take advantage of the deck-level boarding gate, or bulwark door. 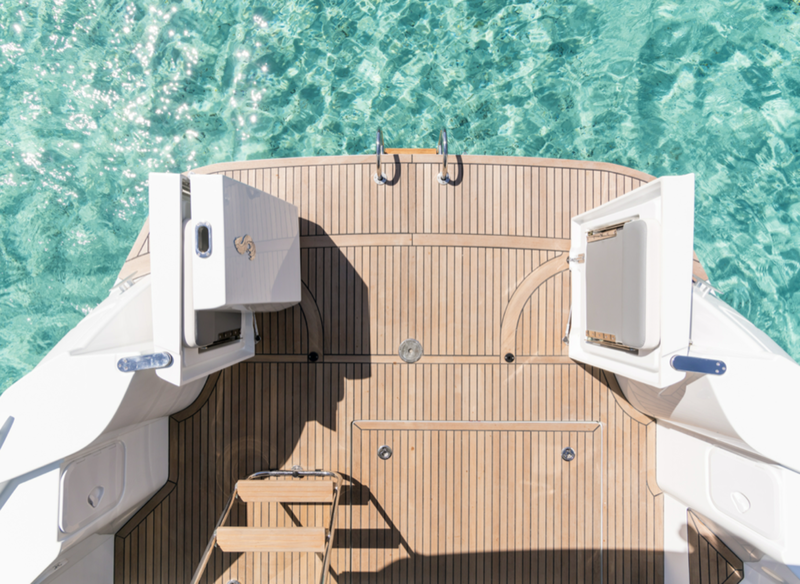 A 24-inch-wide side deck runs the entire length of the boat, while the cabin extends fully to the port side, making the most of the 11-foot, 7-inch beam. Stainless rails and a pulpit provide security while working on deck. As you step into the saloon via the starboard access door, you find yourself at the helm and surrounded by tons of glass and light. It’s like walking into a conservatory without the plants. The visibility in every direction is maxed out. 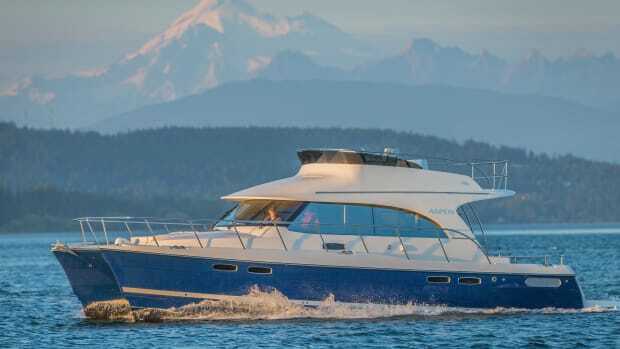 In spite of her compact size, the 30 is built to CE Certification B8 and shares her basic design parameters, scantlings, and modular construction with all of her larger siblings. The end result, to my eye, is a resounding success. 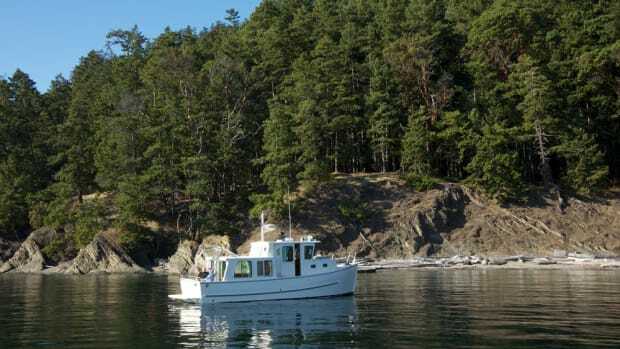 Despite the shared pedigree, though, she includes a number of unique features, such as a fully-opening transom and modular saloon furniture that be configured in a variety of seating arrangements, as well as the ability to convert to a full double bunk with built-in linen storage. The helm includes a double bench seat that converts to a stand-up cushioned station. Although the final electronics package had not yet been installed, the console should easily accommodate any owner’s choice. A handsome 22-inch diameter stainless wheel is wrapped in leather. 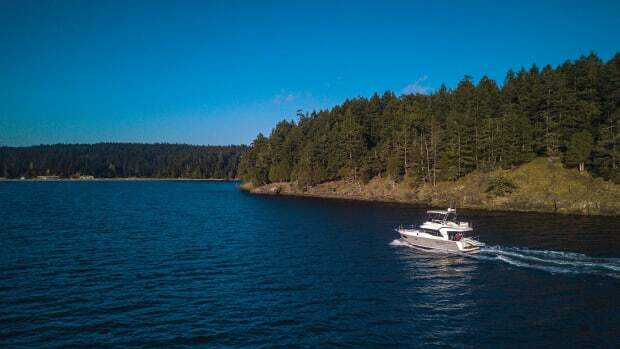 To port is a compact and functional L-galley equipped with a two-burner propane cooktop, stainless single-basin sink, microwave oven, and swing-door refrigerator. The port side of the saloon is home to a settee and stowable table, which can beconverted to a double bed. For a 30-footer, the fly bridge is quite impressive, and serves as the favorite running position. The interior mahogany is varnished with satin gloss, and the sole is laminated Milano oak. Gray tinted glass surrounds the bridge deck, visually connecting this space to the outdoors. 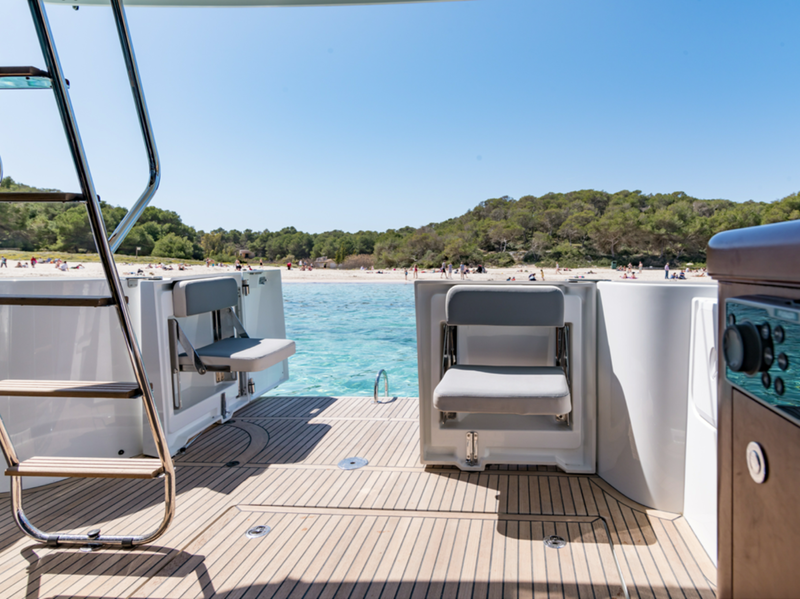 Although the day of our sea trial was blazingly hot and sultry, I couldn’t help wondering how well the air conditioner would cope with the sunlight in even hotter climates. Standard window coverings, though, should help mitigate solar gain in the cabin. 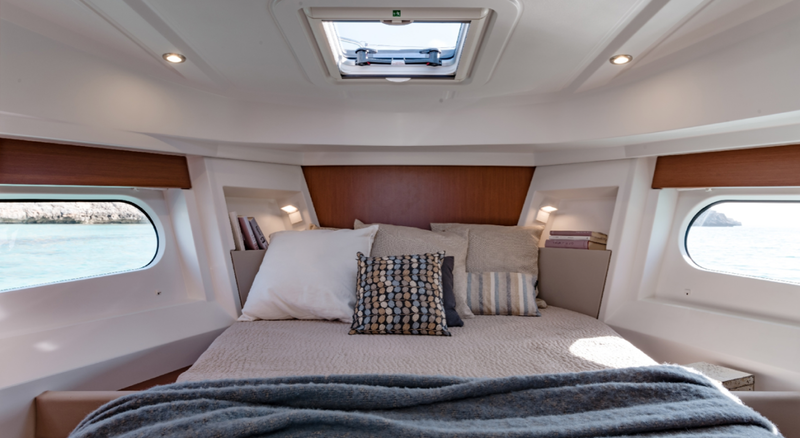 The forward master cabin has a centerline double berth that is mounted lower in the cabin than normal, making it easy to turn in at night, as well as making up the bunk in the morning. Below the foot of the mattress is a hinged locker large enough for two full-size duffels, which is a good thing, as storage space in the cabin is limited to two, half-height hanging lockers, one with shelves. There are two minimally sized shelves on each side of the bunk. The shower compartment, though, measures almost 16 square feet, and is comparable to those found in 40-plus-foot trawlers. An optional layout can replace this with a second cabin to port with Pullman berths, which puts the shower in the normally sized head to starboard. As I stepped up the stairwell leading to the saloon, I noticed an easily accessed panel containing the electrical breakers and fuel shut-off valves outside the engine bay. Good planning there. The engine bay is fully accessible from deck hatches in the saloon. The single 370-horsepower Volvo D6 sits centered in the large bay. The port side of the engine holds most service checkpoints and all water and fuel filters are close at hand. Access to the starboard side requires removal of some of the panels supporting the furniture, but would only be necessary in an event requiring major service. Tons of window-coverage keep this cruiser from feeling cavernous. 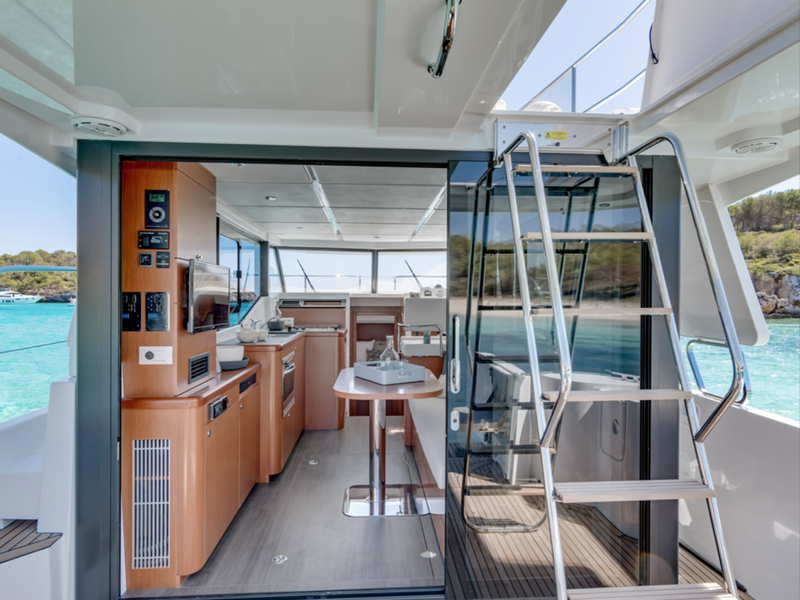 The large, sliding glass door opens to a compact but usable afterdeck. 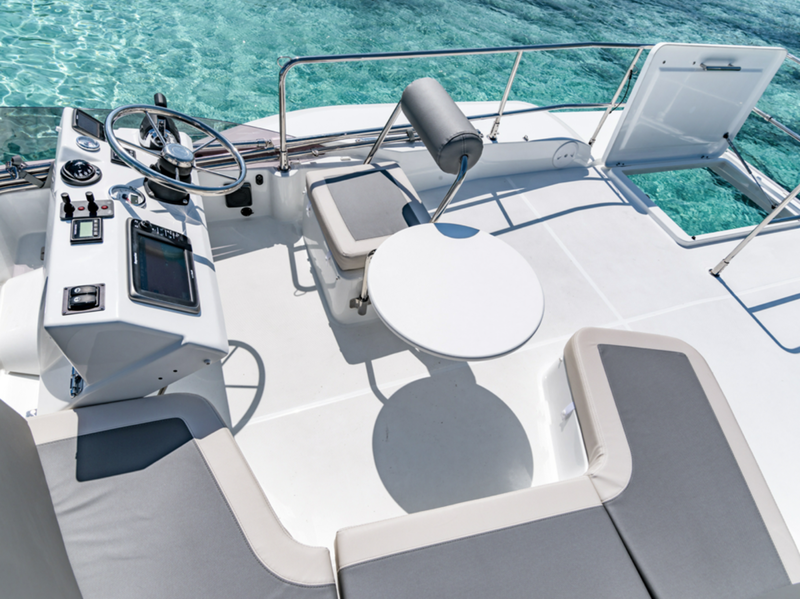 There you find two folding seats that hinge on the rear bulkhead, which itself opens up to extend the afterdeck directly to the swim platform, further enlarging the outdoor space available. One thought for improvement is to reverse the hinging on the three bulkhead leaves. This would give better access to the starboard side of the swim platform and make it easier to board from floating-dock level. A compact open ladder gives access to the upper deck without hampering visibility from the helm. 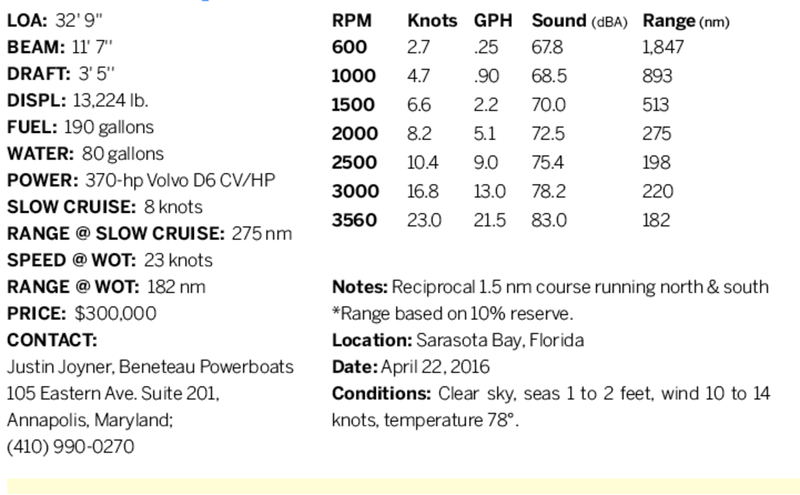 I personally feel that “upper deck” is more accurate than the term “flying bridge.” There is a fully outfitted helm station to starboard and a curved settee to port, as well as handrails all around. The seating is strictly lounge height, however, making it less than fully functional for long-term seating while underway. Additionally, I think that the possible addition of any type of canvas enclosure would look out of place on the sleek profile of the boat. Think of this space as a bonus, not often found on a trawler of this size. There is ample space abaft the seating area to carry a lightweight kayak, but a dinghy would be most conveniently carried on a set of davits from astern. We left the dock of Marina Jack with Justin at the helm working the single throttle in conjunction with the bow thruster. As we entered the depth-restricted section of Sarasota Bay, I became the go-to guy for sailing directions. The boat was awaiting the final navigation package so we were without a depth finder. We headed out toward Big Pass avoiding shoal water on both sides of the vaguely marked channel. Justin turned over the helm and I concentrated on watching the color of the water and the widely spaced marks. As photography was the first order of the day, we spent the better part of the first hour positioning the boat for the best angles. In so doing, I had the opportunity—the necessity—of making many turns and maneuvers at a variety of speeds. Although the sea was minimal, the tide was running hard and the boat felt comfortable. It was also quiet. The decibel levels started at 67.8, which is very comfortable, and increased less than 10 points in its normal operating range, making conversation comfortable the whole time. I wish I could find restaurants so peaceful. Acceleration from idle up to planing speed was very civilized. The turbo kicked in at about 2,200 rpm without a lurch, bringing the boat up on plane. Justin, who has run the boat on a number of deliveries between shows, felt that her planing sweet spot is about 3,200 rpm, making about 17 knots. The transom swings open in order to maximize space on the hook. Quite remarkable for a compact trawler. 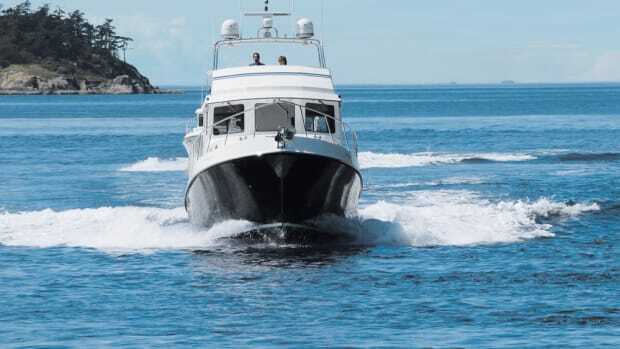 Of course, a typical 8-knot trawler speed would yield a gph reading of just about ¾ gallon per mile and a hefty cruising range of over 275 miles. 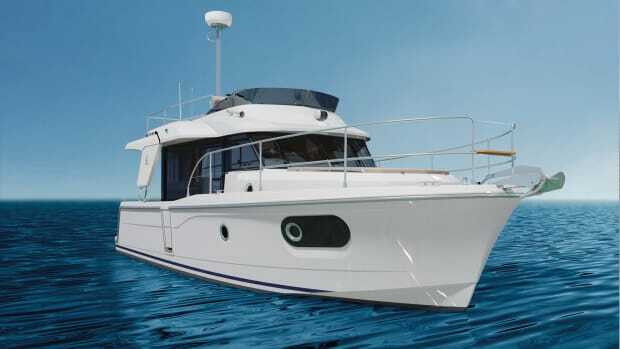 When you examine the growing field of compact trawlers introduced over the past several years, the Beneteau Swift Trawler 30 sits near the top of the heap. Everything within the perimeter of the package falls quickly to hand and seems ergonomically well considered. If you are at all familiar with Beneteau’s successful range of sailboats, the finish, detailing and quality will make you feel right at home. At a base price of less than $300,000 she should also measure up in any value comparison. This was hull number 3, with fifteen more scheduled for production in France. 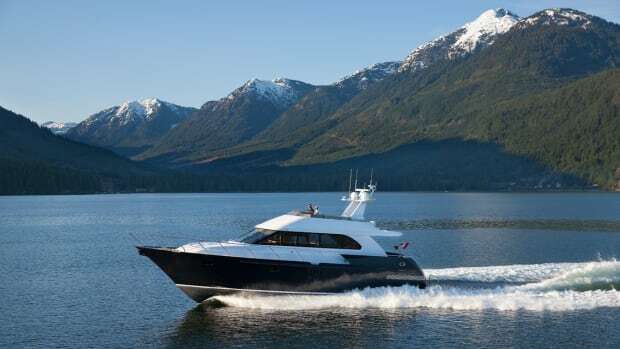 At that point, construction will move to Beneteau’s facility in Marion, South Carolina. Wouldn’t it be fun to fly in and see your new trawler being built?